Software that Posts Cars on Craigslist and More! Market your inventory on Craigslist, Facebook, OVE, Backpage, and dozens of other paid and free sites. Our semi-automated posting tool will make your life easier. If you want to post with ease, save time, and produce professional ads you need to download now and try it out for 14 days at no charge. Dealers tell us all the time that our software does what they want it to do and that others couldn't. If that's you, look no further. Are you on Facebook Marketplace yet!? This classifieds platform is quickly gaining users and pulling consumers and dealers away from Craigslist. Use our automated feed service to send your cars to Facebook. All it takes is setting up your Facebook Business page and our partners do the rest! Facebook Marketplace for dealers is where you need to be. Get started TODAY! Call 866-644-7258 to speak to Brooke or Landon. Contact us today for info and pricing! Autotrader.com and Cars.com are the two most popular places car buyers shop! This is why they charge the big bucks to advertise and this is why you need your inventory fed consistently and reliably! With DSMC your inventory is fed THREE TIMES A DAY so any changes throughout the day get updated. Using DSMC to manage your inventory feed is stress free and reliable. Just ask us why next time you call! Cargurus is quickly becoming the top online marketplace for consumers looking for great prices on cars! Consumers appreciate the site's transparency and abundance of research info and reviews. They offer a free service as well as a paid advertising service for dealers. Neither of which involve any extra work on your end! Fed to Cargurus and processed 3X A DAY! Unfortunately you are not going to sell every car you buy or take in on trade. OVE is your source for wholesaling those vehicles. Get moving! With our online OVE feed management page you can easily set up vehicles to list on OVE. Not only will it provide everything you need to make your listing go live but it will tell you if you are missing necessary data! Cars send as live listings! Have you noticed the recent uptick in online marketplaces like OfferUp and Facebook Marketplace? These sites are really targeting the mobile first generation, meaning consumers who primarily use their phone to access the Internet. 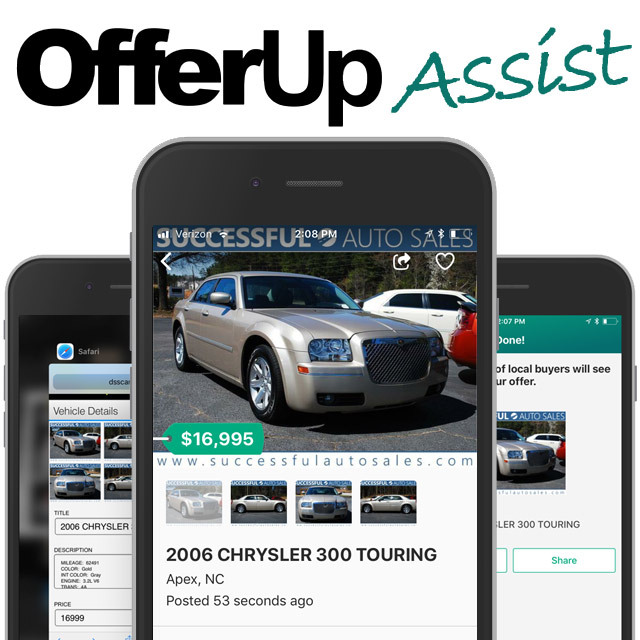 We believe we are now one of the first vendors to offer assistance with posting your vehicles to OfferUp! Since OfferUp is strictly a mobile app we can not create an automation tool or feed to the site. Sign in to Dealer Solutions backend on your phone. Save the car's pictures to your phone. Open your OfferUp App and sell an item. Now add the images from your phone to your ad. Finally, toggle back and forth between Dealer Solutions and OfferUp to copy and paste information to the ad you are posting. It's that easy! Take about 2 minutes to post an ad! No Additional Charge! Included with DSMC! Twitter can be a great place to communicate with customers and shoppers. Occasionally you may want to tweet out a vehicle and DSMC makes that simple. The tweet will include a specialized link that will let you know how many times it has been clicked. See how it works for you! Don't forget about Pinterest! Right now Pinterest offers a great platform for posting your cars for sale. Create a new board for your inventory and use DSMC to post each vehicle. Links included in the "pins" track clicks as well. Pinterest is also indexed by Google, which means when you post to Pinterest that pin can show up in search results. All the more reason to start! Tech support for you Pinterest noobs! YOU SAW. NOW TRY IT! Feed your Inventory to Us! We can accept feeds from dozens of vendors and have your inventory and pictures dropped right into our Marketing Center software. Even if your vendor is not listed below we will work to make it happen. Using the Dealer Solutions Marketing Center your inventory is dispensed automatically to DOZENS of inventory retail sites, both free and paid. We can send your inventory to nearly every website that will accept a feed. This includes Autotrader, Cars.com, Vast.com, Lemonfree, CarGurus, EveryCarListed, FreeBeeAuto, DealerRater and more. Many of the other craigslist posting software programs on the market were designed with tunnel vision. They do not allow many, if any, dealership specific customizations. This can create confusion on craigslist with so many of the dealership ads looking alike. If you want to stand out, we have the solution. Dealer Solutions Marketing Center is a quick and easy tool but at the same time it offers some unique customizations the craigslist power users are looking for. + Does your software AUTO POST to Craigslist? + How many ads a day can I post on Craigslist using your software? As many as Craigslist allows its users to post. That is not a software question. We help provide a professional way to post but how many ads you post is a restriction put in place by Craigslist, not our software. Unlimited! You can add this software program to any number of computers. You can also have one software program and multiple Marketing Center accounts if you post cars for multiple dealerships! + Where do my cars get sent to? We send your inventory to dozens of free websites. The number goes beyond what we can list but some of the major sites include: Vast, Car Gurus, Lemon Free, FreeBeeAuto, etc. Your vehicles can also be sent to sites like Autotrader, Cars.com, Cars For Sale, Homenet, and more. They just require you to have a paying account with those companies and we can send the feed for free! + Can I send you my inventory from another company? Yes, of course! This will make our software even easier. We process inventory every night so your inventory will be updated daily ready for you to post on craigslist! We can accept datafeeds from other companies including: Frazer, Homenet, EbizAutos, Dealer Specialties, Promax, AutoStar, eCarList, Auto Revolution, Autofunds, Friday Net, and more. + Can I post to multiple cities with your software? In short the answer is ‘Yes, it is possible’. Just as you have discovered your own posting methods and tricks of the trade with craigslist you will discover the same thing with our software. It is up to you to make the most of your software as we are only here to facilitate a quick and professional way for your ads to show on craigslist. + Do you protect me from getting ghosted? We do as best we can on our end but most of the time users get ghosted because of their posting frequency. Some things that will get you ghosted are: too many ads posted in a short span of time, too many similar ads, too many ads by the same IP address, too many commas in the ad text, specific keywords used that get picked up as spam, too many links to the same URL. So we do what we can do but it is still reliant upon you, the poster. + How many craigslist accounts can I have? + How does your software protect against ghosting and flagging on craigslist? Our software does not “protect” you from Craigslist. Remember…CRAIGSLIST is blocking you from posting on CRAIGSLIST. We did not create our Marketing Center Software to go against the very site we are trying to post to. We believe by doing so will lead to a stricter and less functional craigslist site. This is probably why you are asking this question. You have seen the tighter restrictions firsthand. The people and software that are only looking for ways around the rules are the ones that are making it tougher on everyone in the craigslist community.